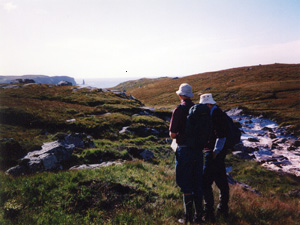 The Cape to Cape walk is an alternative walk to the infamous Lands End to John of Groats walk . It covers 1095 miles starting at Cape Wrath in Scotland and finishing at the Cape of Cornwall. Most walkers planning on doing the conventional Lands End to John O’ Groats (often known as ‘The End to End’ walk) tend to use complete long distance paths like The Cotswold Way and The Pennine Way. This is all very well and cuts down on planning but if you are of an independent nature and do not want to do all the little loops and deviations, that other walks have, then it is worthwhile planning your own route but taking in part of other established routes where it suits. The Scottish part of the walk (400 miles) was the most difficult to organize but once we had found Scottish Hill Tracks published by The Scottish Rights of Way Society it all began to fall into place. We decided to walk North to South on the basis that it would get easier as we progressed! My friend Vivian Cowle was and is still working so we planned it as two separate weeks a year, and to avoid the midges in Scotland, we walked in the spring and the autumn, and in fact we only had one whole day of rain in just over 4 weeks walking. This blog doesn’t allow space for the complete route details but we came down the western side of Scotland from Cape Wrath and used under half of The West Highland Way before cutting across the country on the canals between Glasgow and Edinburgh and crossing the Pentland Hills into the Border country. We then reached England and picked up The Pennine Way near Byrness. We followed a combination of The Pennine Way and The Alternative Pennine Way which is now out of print and not waymarked. This is a rather lower level route than the Pennine Way and also passes through attractive villages with points of interest such as Chatsworth House. We also avoided the dreaded peat hags which are prevalent on parts of The Pennine Way. This also suited my walking partner, Vivian, who had already done The Pennine Way but who also prefers (at his age!) the better things in life such as a single room, regular good meals with lots of wine and several beers as well. Since joining the LDWA, after this walk, my own style of walking has now become healthier, more economical and Vivian would say ‘rather boring’! We left the Alternative Pennine Way at Ashbourne (a lovely town) and then came round Birmingham on the western side via The Staffordshire Way and the Worcestershire Way (we considered a route on the eastern side of Birmingham on The Heart of England Way which links up with The Cotswold Way but both of us had already done this). The Worcestershire Way took us over the Malvern Hills where we picked up The Three Choirs Way down to Gloucester. We then walked south on the Sharpness Ship canal before cutting across to The Cotswold Way near Wotton under Edge. However we were only on the Cotswold Way for less than a day as we then moved over onto The Macmillan Way (an excellent LD path) which took us around Bath and down to Castle Cary in Wiltshire. The next 50 miles or so across Somerset and Devon was not ideal and other walkers might find a better alternative route. We cut across to Taunton, with paths alongside the rivers Tone and Parrot, and then found our own route on minor footpaths to the edge of Dartmoor and Okehampton. We then joined the excellent Two Castles Trail which took us down to our last county Cornwall and the old town of Launceston. We had originally been rather concerned about our route through Cornwall, but since starting the walk some three years previously, we had now found The Celtic Way book which gave a really interesting route through the county. This took us across Bodmin Moor and then along little used footpaths past the mining areas around Redruth and Camborne, and then between St Ives and Penzance, to Cape Cornwall, which is an infinitely better place to finish than Lands End. Overall we walked 1095 miles which is about 240 miles longer than the shortest Lands End to John of Groats route but is far more interesting and has a lot less road walking. If you want more details feel free to get in touch!